Here are all the new announcements and details from today's Smash-centred Nintendo Direct. Nintendo certainly didn’t hold back in their brief but busy Super Smash Bros. Ultimate Direct today, announcing a treasure trove of new content and characters for the game. After only releasing news of the Direct last weekend, we never expected to be flooded with so much information at once! Here’s everything new that we now know about Super Smash Bros. Ultimate thanks to today’s Nintendo Direct. Nintendo kicked things off with a cinematic intro for Simon Belmont, whip-wielding vampire hunter from the Castlevania series. Simon had been rumored for some time and an early leak this morning indicated he’d be popping up today, but what we didn’t expect was for Richter Belmont to join him as an Echo fighter as well. Later down the line we also got a look at Chrom and Dark Samus who appear as Echo Fighters of Ike and Samus, respectively. Both look to have kept the majority of their original’s movesets, though we can expect some changes in speed damage and all the rest. Finally, a surprise ending announcement revealed King K. Rool, nefarious villain from the Donkey Kong series. He’s another heavyweight baddy capable of dishing out serious damage and reflecting attacks with his armored belly. Announcements weren’t simply limited to characters. Game director Masahiro Sakurai also revealed that Ultimate will include a whopping 103 unique stages, though if you count the Omega versions then that number rises all the way past 300! The Direct showed off the stage select screen with every level listed, though it’s worth noting it also had some teastingly empty space along the bottom line. While the bulk of included stages are from previous games, we got a look at some brand new ones today too. Dracula’s Castle is the darkest stage in the game thus far, and includes unique characteristics. Attacking a candle will cause items to spawn, and from time to time a range of monsters from the Castlevania series will appear to attack players such as Werewolves, Carmilla, Death and even Dracula himself! We also got a look at a New Donk City Hall stage from Mario Odyssey which soars up skyscrapers and even introduces Mayor Pauline with the festival band. Sakurai made a point to note that while old levels had been graphically tuned up, N64 levels retained their classic feel. Sakurai also revealed that Ultimate will have over 800 songs included which is, frankly, too many to list here and more than a bit insane! You'll also be able to listen to them while carrying the switch in portable mode so that you never have to miss out on your favorite gaming tunes. Competitive players will be happy to hear that Ultimate will now remember whatever rules you pick for the next time you play, letting you keep a preferred setup for each game. Stamina mode is also now considered a main mode you can select, giving it a bigger presence in the game. You’ll also have the option to enable chargeable Final Smashes, letting players build up meter in a match before unleashing a weaker version of the normal Final Smash. It should be for an interesting addition to the game, and could even make an appearance in competitive play. 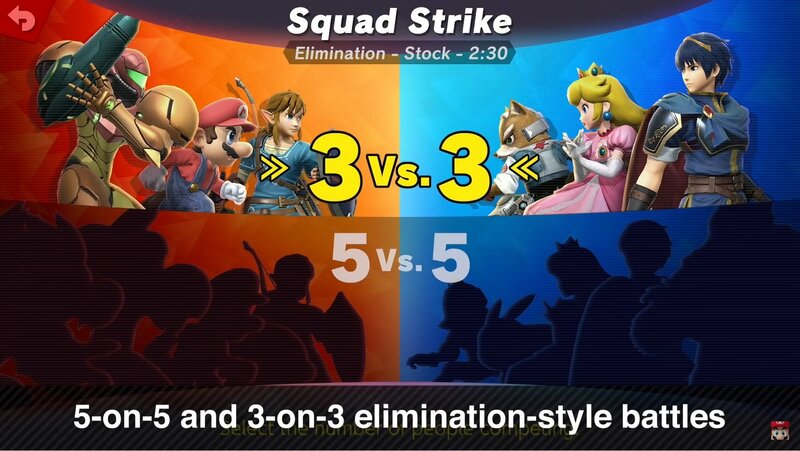 A brand new mode, Squad Strike lets you set up a 3v3 or 5v5 elimination battle which lets you take part in a series of 1v1 matches with each player having five different fighters to bring out in consecutive matches. Traditionally known as a Crew Battle format, you could also choose to have different players take each characters to set up team-based matches of 1v1 fights. A Tournament mode is also available which lets up to 32 players join an automatically formatted bracket and fight their way to the top. In addition there’s a final mode called Smashdown. In this mode after each fight, the previously selected characters will no longer be usable, forcing players to choose new characters each time. Those who can master a number of different fighters will see their efforts pay off here! Training mode has been spruced up too with a unique stage which shows launch trajectories based their damage so you can see how far you can hit them. 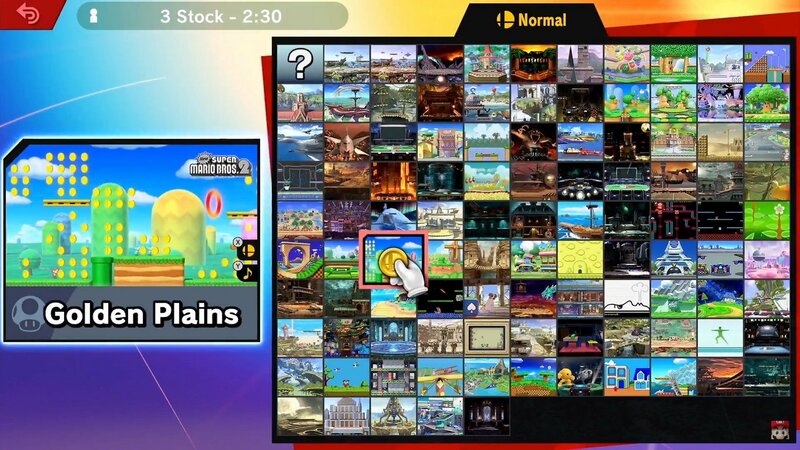 Classic mode also returns, with each character facing a set series of stages and opponents to battle through. The mode includes a range of bosses even from outside the Nintendo series. 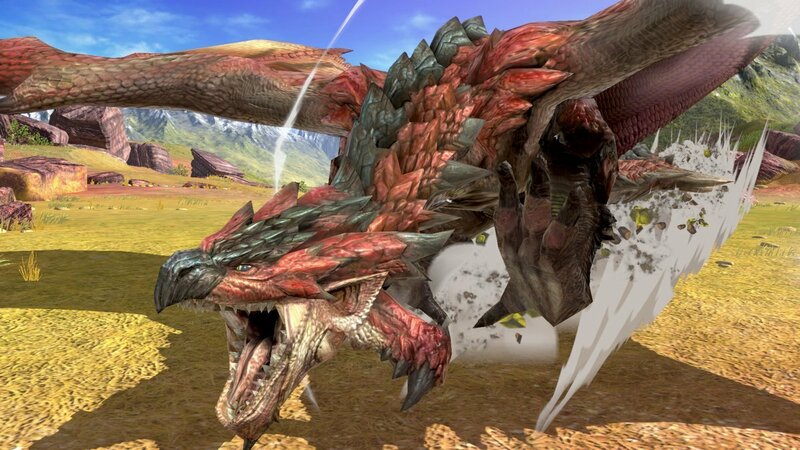 During the Direct we got a look at Rathalos who can also pop up as an Assist Trophy. There’s also one final mystery mode visible on the title screen for Ultimate. It was blurred out during the presentation, with Sakurai promising more details later. Considering Online is already visible on the screen, this could refer to some form of story mode for the game in addition to Classic, though there’s no confirmation of this yet. That’s all the big news we have so far for Ultimate, but there were plenty of items and assist trophies shown off in the Direct too, give it a watch yourself below to catch up on all the details. If you're in the mood for more Super Smash Bros. Ultimate action, we recently went hands on with the game. It's shaping up well, so take a look at our thoughts here!